Is the seed stitch and the moss stitch the same pattern? And have you heard of the double moss stitch? Basically they're all beautifully textured knitting stitches and depending where you live you may call the moss stitch the seed and vise versa. As far as the double moss stitch goes, again, some people will call it that and some will call it the double seed. Are you confused yet? Well don't worry, the main thing is that all these knitting stitch patterns are easy to knit no matter what you call them. And you just need to know how to knit and how to purl to make them. One thing for sure, these stitch patterns have been around for a very long time. They're timeless and they're fun to knit. My favorite stitch pattern is the moss stitch. It looks just beautiful as an allover pattern for a sweater or blanket. Basically the seed stitch and moss stitch are simple pattern variations of each other, kissin' cousins, haha I will show you how I was taught which may differ from others. But the important thing is to have fun knitting these pretty stitches. These patterns will also be handy to know because they are used in a lot of knitting patterns in many different ways. Try them all or pick the one you like and lets get started. This is the first pattern stitch I learned and it's very simple to do. Basically it is a type of ribbing that is broken up on every row. Just look at all those bumps. They look like seeds. It's a really pretty pattern, very clean looking and the bumps add such a nice textured pattern and feel. You just have to give it a try so you can see for yourself and squish it too. It really feels cool. You knit the purls and purl the knits. What this means is you put a knit stitch over a purl stitch and a purl stitch over a knit stitch making seeds. Have a quick look below to see the knit stitch on the needle and the purl stitch so you can identify them. Remember that the knit stitch on your knitting needle looks like little v's and it's the smooth side as in the photo on the left. The purl side looks bumpy like this photo on the right. Thought it might help to see these stitches on the needles. Knitting this pattern stitch is a great way for beginners to practice the knit and purl stitches and will help you learn how to identify each stitch. Over time you'll want to learn how to read your knitting and that's why I keep showing extra pictures. The seed stitch pattern creates an allover bumpy texture. It lays flat and doesn't curl making it a nice alternative to the rib stitch. It makes a wonderful textured pattern. You can use seed stitch for pretty much anything and it's even reversible. It makes a really pretty border along blankets, cuffs on sleeves and socks. 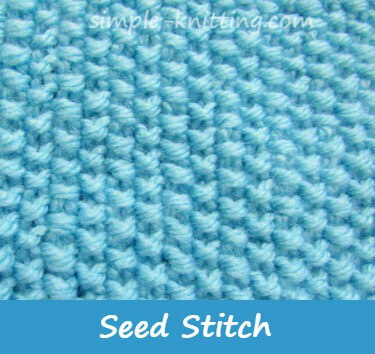 Seed stitch is also very pretty as an allover stitch pattern. Try using it for a hat, scarf, sweater, dishcloth, place mat, or even a pillow cover would be nice. I find it to be a very striking stitch pattern and looks really pretty. There are a couple of ways to make this pattern so I've included both. I love this version of the moss stitch pattern. It is so simple and pretty. Moss stitch will be lovely in a nice sweater or a blanket, hats and knit scarves, shawls, well actually anything. It's such a nicely textured pattern stitch and feels really nice. Knitting moss stitch is simple to do and it looks the same on both sides. I like knitting this as an allover pattern rather than a border because it really looks quite stunning. 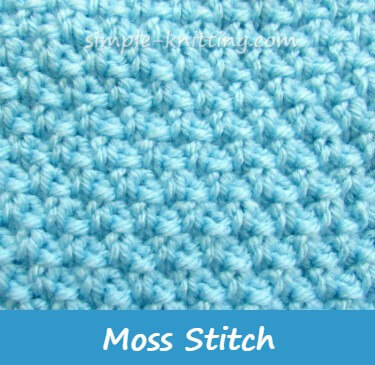 The double moss stitch is basically the same as the moss stitch. The only difference is that rather than K1 and P1, you will K2 and P2. It's also called the double seed stitch by some. But since it's so much like the moss stitch it makes sense to me to call it double moss. The double moss is a heavily textured pattern and has a really nice feel to it. It's even quite stretchy. It lays flat and doesn't curl and this textured pattern is also reversible. 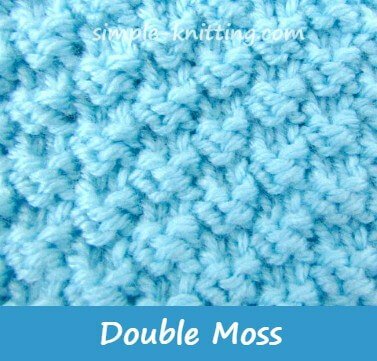 You can use the double moss stitch as an allover pattern stitch for things like a knit hat, pillow cover, blanket, scarf and even a big comfy sweater or shawl. It's always nice when textured stitch patterns are reversible. Have fun with these stitch patterns. Try them all and see which ones you like. Wondering how much yarn you need? I am a participant in the Amazon Services LLC Associates Program, an affiliate advertising program designed to provide a means for sites to earn fees by advertising and linking to Amazon.com and affiliated sites. If you make a purchase through one of my links I may receive a small commission. This will not affect the purchase price and you will not pay more when you buy through my link.